Equity release is the process of releasing the owned value in your home to provide a cash lump sum, which can them be either used for further home improvements, holidays and more. Equity is defined as the percentage share you own in the value of you home. For example, if your property is valued at £250,000, but your outstanding mortgage is £150,000 your equity would be £100,000. Negative equity, by comparison, would represent an instance in which your mortgage is higher than the value of your home. Equity Appreciates and Depreciates for a number of reasons, including demand for housing in your area, and home improvements, and it is common for equity release to be used for home improvements which further increase the value of your house. Equally common is the distribution of Equity into either purchasing a new home or freeing up cash by downsizing to a cheaper property. Remortgaging represents the process of unlocking equity in your property. Usually calculated on a loan to value ratio, this can assist in providing a cash sum from your owned equity, or contribute to a higher value mortgage. 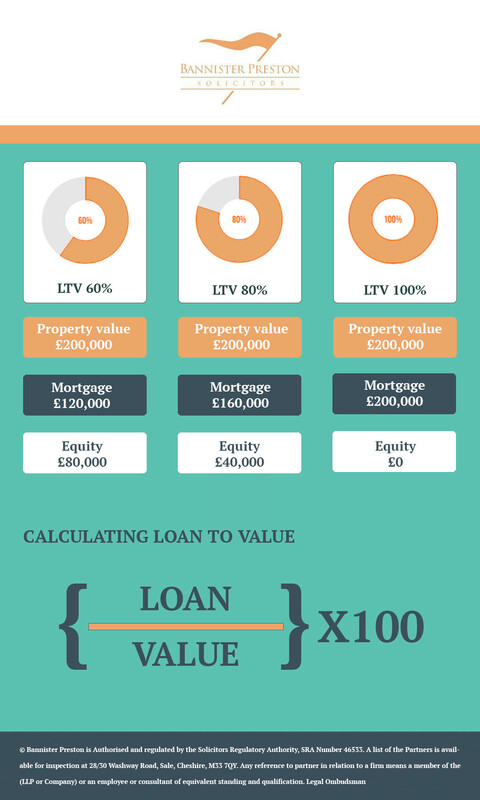 Loan to Value, calculated as ‘Loan/Value x 100’is used to calculate how much equity you may be able to free from your property, with many commercial lenders now providing up to 95% LTV mortgages. The following infographic explains this further. For more information on how we can assist your remortgage and equity release contact our conveyancing team today.